Do you know that God was the first one to be in the recycling business. He can take the most vile thing and turn it into a treasure. Do you know that deep in the sheep’s matted wool is an ointment called Lanolin. This ointment has been used for centuries to heal dry cracked or burned skin. It is used for many different things and is comes in many different forms. The steeper the climb and the rougher the terrain the more the sheep sweat. The more they sweat the more ointment they produce. The word ointment comes from a Latin word that is also translated anointing. It’s as though the sheep are anointed to bring healing, but they don’t have a clue. The word anointing means to smear on. The sheep don’t realize there is something valuable in their backbreaking load, something that can be smeared onto someone’s calloused hands or dry, cracked skin. Unbeknownst to them they are carrying around the cure for the wounded, but they think they are just dumb sheep shouldering a heavy load. On my travels in Australia I met a sheep shearer who explained that the number one mission of the shepherd is to get the sheep on the shearing table so their heavy load can be lifted and the yolk can be broken. That is how the ointment will be extracted so it can then be smeared onto someone’s dry, cracked skin! Unfortunately the number one mission of the sheep is to avoid the shearing table at all costs because they are fearful of being nicked, nipped, or bruised. They don’t want to be undressed, uncovered, naked, or exposed. They have no idea that their momentary pain could be used for someone else’s good. If the sheep continue to avoid the shearing table, the weight of the wool will eventually cause them to tip over, and they will be unable to get up on their own. Because the shepherd knows this and the sheep’s value, he boxes the sheep in until it has nowhere else to go and can do nothing except surrender. As the load is lifted, the wool goes through an intense scouring process actually called “power washing.” The wool is placed between rollers, or “put through the ringer,” as I like to refer to it. As the wool is untangled, the yolk is broken, and the sweat is separated from the ointment. The ointment is now distributed in many different forms to heal someone else’s dry, cracked skin. Can you see the parallel between the life of the sheep and our life? Could it be that somehow mixed up in our tangled, matted mess and the sweat of our everyday burdens is the cure for someone’s dry, bruised life, but we can’t see it because we think we are just dumb sheep carrying a heavy load on our backs? We fail to realize that the more difficulties we go though, the more anointing and wisdom we have to share from our life experiences. We rarely think that we have sitting on the inside of us what it takes to heal someone else, but we do. But in order for it to be shared, we have to be sheared! We have to get that heavy burden off of our backs and into the hands of the Good Shepherd. Unfortunately, just like the sheep, we avoid the shearing table at all costs. We don’t want our past struggles to be uncovered, and we don’t want our present struggles exposed. We just want to get by, leaving everything hidden and out of sight. 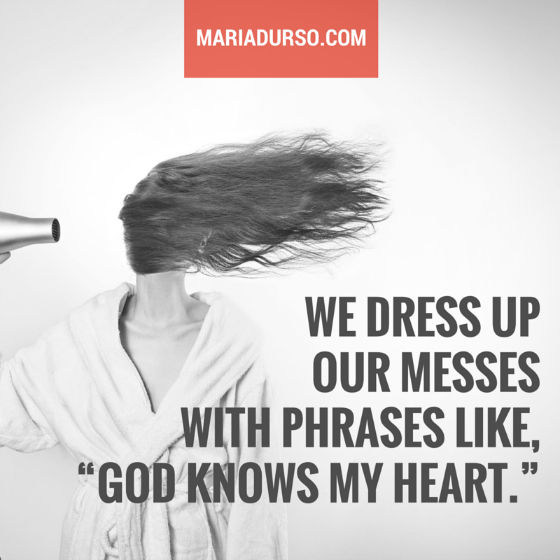 We are so afraid of what other believers will think, we become experts in dressing up our messes. We comb our matted wool, condition it, and even put pretty pink bows on it. We make excuses for it, like we’re having a bad hair day. We do everything but surrender it, because surrender is painful. We don’t want our perfect exterior to be cracked. So we just keep putting spiritual outfits on our stinky, smelly life. Or we put on our game face when we come to church, though all the while we are suffocating under the weight of our heavy load. All the Good Shepherd wants to do is power wash us. He wants to lift the burden and break the yoke (Matt. 11:29–30) so that the anointing can be extracted and released and smeared on somebody else’s open wounds! We don’t realize that our pain has the potential to be somebody else’s eternal gain, that our mess has the potential to become a message of hope for the hopeless. We don’t realize that anything and everything we have been through has the potential to become a life lesson for someone else. We don’t realize that our greatest problem has the potential to be our greatest pulpit—that yesterday’s stench is today’s anointing! I always say, “Let your trials pay you dividends—double for our trouble—and bring others much-needed relief.” The only way for us to do that is to move just eighteen inches to victory. Question: Are you dressing up your messes? « What in the World Are We Thinking?